French mathematician; born in France in 1792; died in Paris Feb. 27, 1865. He early showed an aptitude for mathematics, and in 1813 entered the Ecole Normale at Paris, where he studied until the political upheaval of 1815 caused the suspension of the school. In that year, when walking with some of his schoolfellows in the Champ de Mars, where the troops were drilling, he was accidentally shot in the leg, and the wound never perfectly healed. Being a Jew, he was unable to obtain a chair in mathematics; but he found employment first in a porcelain factory and then as a private tutor. In 1818 he was employed as actuary by the Compagnie d'Assurances Générales of Paris. He then studied in London, returned to Paris, was chosen by the company from among three distinguished mathematicians, and soon became its vice-president. In 1828 he became president of a new life- and fire-insurance company, founded by the Foulds. Maas labored actively in the interests of the Jews; in 1830 he became a member of the Central Consistory, and thirteen years later its vice-president. His death was caused by a malady that developed from his wound. A eulogy upon him was read in the directors' room of the company, and his old schoolfellows had a medal engraved in his honor; this was delivered to his son, who assumed the position and responsibilities of his father. 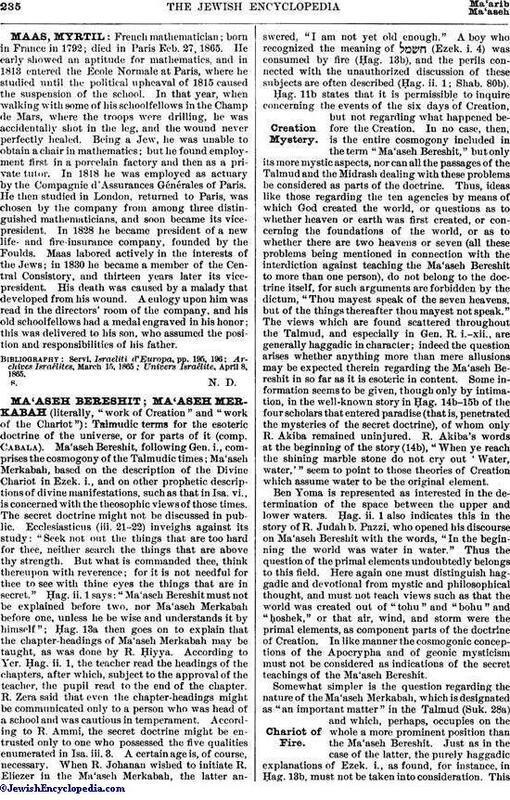 Univers Israélite, April 8, 1865.